The NORTH pole is on one circular face and the SOUTH is on the opposite face. The NORTH and SOUTH poles are 5mm apart. 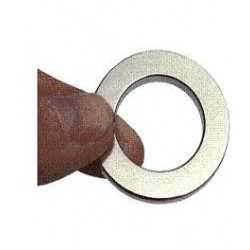 These magnets are anodized plated and have approximately 3,200 Gauss on each face. NOTE: These magnets should be handled with great care! If your fingers are trapped between two of these magnets, they will cut the skin.